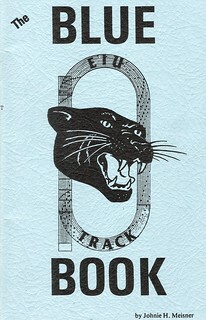 The BlueBook is the definitive book on Eastern Illinois University Track & Field and Cross Country. It contains history, records, and traditions. 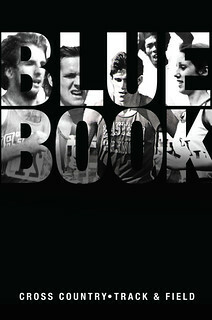 Johnie H. Meisner, a former athlete and assistant coach, originally published the “BlueBook” in the late 1970’s. You can still read Johnie’s afterword at the end of this book, in which he gives his reasons for its creation. It’s been an honor to bring the BlueBook back into print - and I am humbled to write my thoughts along with the editors that came before me. 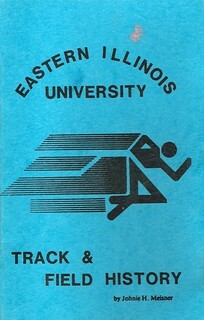 We have a great history at EIU – and I hope to continue to spread that great tradition as those before me have. Of course, I did not do this alone – I’ve had constant help from many (Nic Atkinson, Brad Runnion, Dr. Woodall, Coach Mac, Caitlin Napoleoni, Gaby Duenas, Brad Butler and the rest of the coaching staff to name a few). This is the first edition of the BlueBook to include women’s history – while this is a great accomplishment that took hours upon hours of work; I’m still disappointed with how it turned out. We knew it was a great task to start from the ground-up with the women’s history, and we didn’t get it done with the level of detail I had hoped. At the same time I am proud that we started the great task – there are so many great women that have competed wearing the EIU colors that it is a shame their history is not better documented. We have set the foundations, and I hope that in the future we can continue to showcase the great history of the EIU Women’s Track and Field and Cross Country Teams in the manner they deserve. As you have paged through the book, you’ll hopefully have felt a sense of nostalgia – we’ve purposefully left in as much of the original material we thought was still meaningful or just neat. Its been one of the joys while working on this project – holding results in my hands that are over 50 years old, hand-typed with notations scribbled on them, and a smell of a book that you just got from the library that hasn’t been checked out since god-knows-when. It certainly made me cherish the few years that I got the opportunity to compete for EIU and be part of such an enduring tradition. I hope that you have enjoyed this edition of the BlueBook. We’ve updated all the records, started including facility and meet records, and tried to include some new content where possible.